Well three weeks later I have learned that the bike belonged to someone I know and NOTHING has been done about it and no one has stepped up to help. Sure, I get that the transition zone was manned by volunteers and I’m all about the volunteer love (we wouldn’t have our races without them), but these races pull in tons of dough and The Canadian hosted by Somersault isn’t a small race series, however, the race directors have pretty much told him they are not responsible and three weeks later he is still sans bike. So what can we as athletes do? 1. Be aware. Look around! You’re likely already scoping out the other bikes, so why not do a little check to make sure that their bib matches their bike. 2.Speak Up. If you see someone doing something that looks suspicious or if you see an athlete pushing a bike with a different race number do something! Approach the athlete and make small talk around the bike, ask them how it rode no need to be confrontational, just see how they reply. You could get security if you’d rather not get personally involved. Or my favourite trick (yes I’ve done this before) take a photo with your phone of the suspicious encounter and hold on to it in case something like this is ever reported, and then obviously delete it if nothing happens. 3. Insure your bikes! Especially when you are racing a bike that is the price of a car, get insurance for it! I’ve opened my blog to guest posts in the past, and of course am happy to share my blog friends with Adam in order to create awareness for his stolen bike in hopes that it might be found or someone – Cervelo – Somersault – Triathlon Canada – who knows who? might help. The follow post is from Adam’s blog available at Target Trainers. You can connect with Adam through his blog or on twitter. I’ve Been Violated & Need Your Help! Is this what the sport of Triathlon has come to? I attended The Canadian this weekend which is a huge event in Ottawa run by Somersault Events. They had about 16 different events going on throughout the day some of which included the Iron & Half-Iron distances. I competed in the Half-Iron Triathlon. For those of you that are not familiar with the sport of triathlon, prior to the race, athletes (and athletes only) are permitted to enter the transition zone to set up their area for the race. This area is supposed to be secure and safe for athletes to leave their belongings during the race. No one, other than the athletes are permitted to enter this area at any time and there is usually security at the entrance and exit to this transition area. I set up my transition area with all my equipment: biking shoes, running shoes, helmet, bike, sunglasses, nutrition…and left for the beginning of the race with my wetsuit down by the beach. 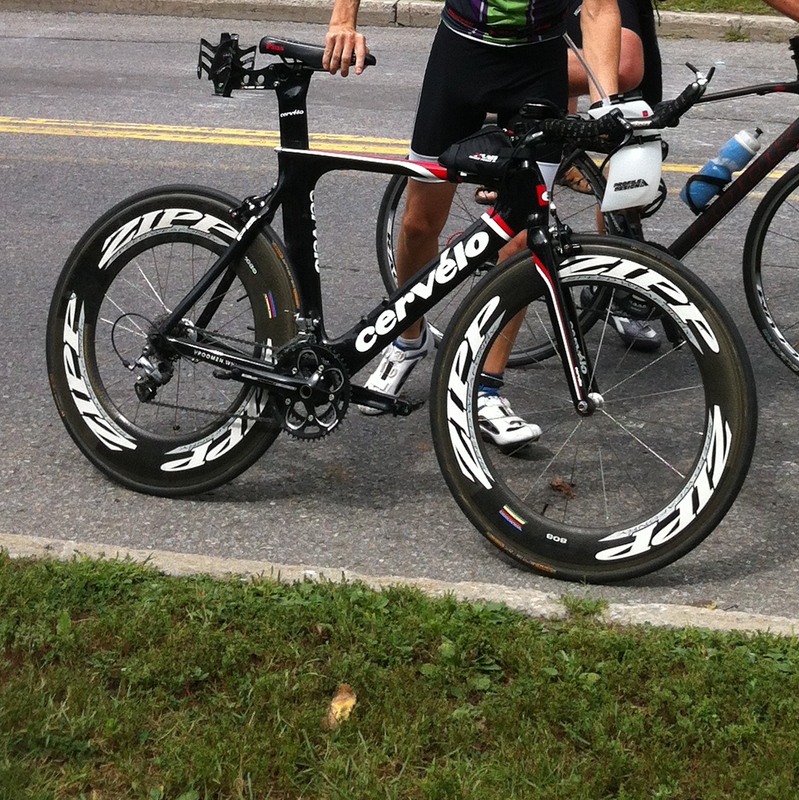 After the swim I ran to the transition zone, got changed, grabbed my bike and headed out for the 90km ride. I returned to the transition zone from the bike and dropped off my helmet and bike, switched shoes and headed out on the half-marathon run. The run took WAY longer than expected as I had some issues that is for another blog post. When I returned to the transition zone after the run at the end of the race, I found my towels, wetsuit, helmet, shoes…but my bike was gone! My bike was gone! I searched the rest of the transition zone to see if maybe it was moved for some reason…nope. I began to panic…I found the race director immediately. Of course they couldn’t understand how this could happen and that it has never happened before. Without putting it into words, they said they couldn’t be responsible for the bike. They said perhaps someone took it accidentally and will return it once they realize. That would mean there should be a left over bike at the end of the night (which there wasn’t). They said they’d send out an email blast to all participants asking them to check if they took home the right bike. They said they’d contact all bike shops and send them a photo of the bike in case it turns up. Here’s my issue…my bike has been stolen! I now do not have the bike…to make it worse, the wheel set I had on the bike did not belong to me, I borrowed them from a friend! There is a lot of value to the bike and now it needs to be replaced! How could someone walk out with the wrong bike…I mean seriously? You put your bike on/in your car and don’t notice that it’s not the bike you came with? Why didn’t security match bikes to bib numbers as people left the transition zone after their race? There were no left over bikes at the end of the night. Why did this happen to me? This is becoming a problem. I am not the first victim of this crime. It seems that this has started happening even on the grand stage…at Ironman events and they are now photographing bikes with athletes so when they leave the race, they are taking the correct bike home with them. I then thought…if a criminal really wanted to take a bike…they actually could quite easily. All they need to do is purchase entry to a race (which gives them access to the transition zone and only costs a few hundred dollars – if that), scout out the transition zone, wait around, and when an athlete drops off the bike, walk into the transition zone, choose a bike and take it home. A simple way to make thousands of dollars. Somersault Events sent out an email blast last night asking people to check their equipment to ensure they didn’t accidentally to the wrong bike. I have heard nothing as of yet. If you come across it, please let me know. I really appreciate all the support and help I’ve been receiving so far. A criminal likely would not even need to go as far as purchasing a race entry – at many events it’s possible to just walk in to transition without being stopped. In all my years of doing tris the K-Town tri in Kingston is the only tri that has an exceptionally secure transition and ensures that the bikes coming out of transition belong to the person with that bike (bikes have a sticker with your bib # and you must show your bib #). As the race takes place in downtown Kingston, where there are lots of tourists and regular city people around, I appreciate the extra step they take. I think all tris should adopt this as a security method. Thanks for sharing your experience in Kingston. This year I was at IronMan Mont Tremblant and security was also very well done. When entering the transition all bikes were photographed with their owner. Security was extremely tight with many volunteers at every exit and like you shared they were corresponding wrist bands to bike number, so every person entering and leaving had a personal interaction with security. I agree in hoping that all tris take this extra step for security. I agree that security needs to be stepped up… Toronto Triathlon Festival did a fairly good job as well. They checked wrist bands to your bike sticker. I can steal your bib number just as easily as your bike, many athletes leave their bibs in transition with their bike during the swim at least. So I think wrist bands was the way to go. But no matter what precautions we take people will get around it. Its a big transition area and only so many volunteers. I walked into Muskoka transition zone a few weeks ago with no wrist band (wasn’t racing) and no one stopped me…. I also like to add I didn’t steal a bike. Volunteers just are not trained security guards and don’t really know what they are doing or what to look for. I think the best solution is to have actual trained security personnel in the transition areas (not just the entrance and exit) from the time athletes drop off their gear until a predetermined time after the race to give athletes an opportunity to collect their gear. For most major races the addition cost could probably be absorbed. But I for one wouldn’t mind $5 extra race fee for the added security (consider anywhere from 300 at small local events to 2500 at major international events… $5/participate should cover extra security). Thanks for the post Heather and Adam… I hope with the amount of press this has gotten it will be near impossible for the culprit to sell or even ride the bike in public, let alone race with it.